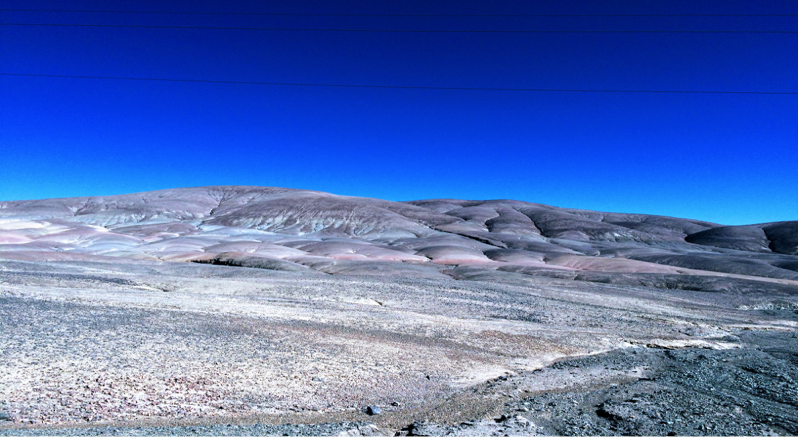 Alteration and mineralization conditions in the Don Manuel porphyry. Brugge. Regional controls on water table depth in the Northern Atacam desert. L. Evenstar. The Cardones ignimbrite; development and destabilization of a complex, zoned and fractionated magmatic system. M. van Zalinge. A structural cross section along the Quipisca Quebrada, Mamina area, Tarapaca province, Northern Chile: Insights/ implications for tectonics, granite emplacement mechanisms and Andean Orogenesis. D. Hutton. Tattitch, Brian & D. Blundy, Jon., 2017, 'Cu-Mo partitioning between felsic melts and saline-aqueous fluids as a function of XNaCleq, fO2, and fS2.' American Mineralogist. 102. 1987-2006. 10.2138/am-2017-5998. Debbie P.W. Tsang, Simon R. Wallis, Koshi Yamamoto, Makoto Takeuchi, Hiroshi Hidaka, Kenji Horie, Brian C. Tattitch, 2018, 'Zircon U–Pb geochronology and geochemistry of the Cerro Colorado porphyry copper deposit, northern Chile', Ore Geology Reviews, Volume 93, Pages 114-140, ISSN 0169-1368, DOI: 10.1016/j.oregeorev.2017.12.019. Gilmer, A, Sparks, S, Blundy, J, Rust, A, Hauff, F, Hoernle, K, Spencer, C & tapster, S 2018, 'Petrogenesis and assembly of the Don Manuel igneous complex, Miocene-Pliocene porphyry copper belt, Central Chile' Journal of Petrology. Andrey Afanasyev, Jon Blundy, Oleg Melnik, Steve Sparks, 2018, 'Formation of magmatic brine lenses via focussed fluid-flow beneath volcanoes', Earth and Planetary Science Letters, Volume 486, Pages 119-128, ISSN 0012-821X, DOI: /10.1016/j.epsl.2018.01.013. Gilmer, Amy & Sparks, R.S.J. & C. Rust, Alison & Tapster, Simon & D. Webb, Adam & Barfod, Dan., 2017. 'Geology of the Don Manuel igneous complex, central Chile: Implications for igneous processes in porphyry copper systems.' Geological Society of America Bulletin. 129. B31524.1. 10.1130/B31524.1. Schöpa, A, Annen, C, Dilles, JH, Sparks, RSJ & Blundy, JD, 2017, 'Magma Emplacement Rates and Porphyry Copper Deposits: Thermal Modeling of the Yerington Batholith, Nevada' Economic Geology, vol 112, no. 7, pp. 1653-1672. DOI: 10.5382/econgeo.2017.4525. Van Zalinge, M, Sparks, S, Evenstar, L, Cooper, F, Aslin, J & Condon, D, 2017, 'Using ignimbrites to quantify structural relief growth and understand deformation processes: Implications for the development of the Western Andean Slope, northernmost Chile'. Lithosphere, vol 9., pp. 29-45, DOI: 10.1130/L593.1. Mavrogenes, J., Blundy, J.D., 2017, Crustal sequestration of magmatic sulfur dioxide, Geology, v. 45, p. 211–214, doi: 10.1130/G38555.1. Mutch, E.J.F., Blundy, J.D., Tattitch, B.C., Cooper, F.J., Brooker, R.A., 2016, An experimental study of amphibole stability in low-pressure granitic magmas and a revised Al-in-hornblende geobarometer, doi: 10.1007/s00410-016-1298-9. Cooper, F.J., Adams, B.A., Blundy, J.D., Farley, K.A., McKeon, R.E., Ruggiero, A., 2016, Aridity-induced Miocene canyon incision in the Central Andes, Geology, v. 44, p. 675–678, doi:10.1130/G38254.1. Matjuschkin, V., Blundy, J.D., Brooker, R.A., 2016, The effect of pressure on sulphur speciation in mid-to deep-crustal arc magmas and implications for the formation of porphyry copper deposits, Contributions to Mineralogy and Petrology, 171:66, doi:10.1007/s00410-016-1274-4. van Zalinge, M.E., Sparks, R.S.J., Cooper, F.J., Condon, D.J., 2016, Early Miocene large-volume ignimbrites of the Oxaya Formation, Central Andes, Journal of the Geological Society, doi:10.1144/jgs2015-123. Evenstar, L.A., Hartley, A.J., Archer, S.G., Neilson, J.E., 2015, Climatic and halokinetic controls on alluvial-lacustrine sedimentation during compressional deformation, Andean forearc, northern Chile, Basin Research, v. 28, p. 634–657, http://dx.doi.org/10.1111/bre.12124. Blundy, J., Mavrogenes, J., Tattitch, B., Sparks, S., Gilmer, A., 2015, Generation of porphyry copper deposits by gas-brine reaction in volcanic arcs, Nature Geoscience, v. 8, p. 235–240, doi:10.1038/ngeo2351. Evenstar, L.A., Stuart, F.M., Hartley, A.J., Tattitch, B., 2015, Slow Cenozoic uplift of the western Andean Cordillera indicated by 3He in alluvial boulders from the Pacific Planation Surface, Geophysical Research Letters, v. 42, doi:10.1002/2015GL065959. Matjuschkin, V., Brooker, R.A., Tattitch, B., Blundy, J.D., Stamper, C. https://link.springer.com/article/10.1007%2Fs00410-015-1105-zC., 2015, Control and monitoring of oxygen fugacity in piston cylinder experiments, Contributions to Mineralogy and Petrology, 169:9, doi:10.1007/s00410-015-1105-z.